Robert Bates is a teacher and a healer. A 1990 graduate from Southern California College of Chiropractic, he came home to Northwest Washington state to open his healing practice. He is a licensed Chiropractor, holds a Master of Medical Qigong degree, is an experienced Cranial Sacral Therapist (also called cranio-sacral therapy), and an excellent coach for professional healers. Robert is dedicated to his personal Qigong practice, which includes Wild Goose Qigong, Healing Tao exercises, Chen style Tai Ji, Five Animal Frolics and more. Zhang Jie, Seattle, WA: My first actual Qigong training. Longevity Qigong and Snake Qigong. Minke De Vos, British Columbia, Canada: Healing Tao meditations and exercises, Taoist Yoga, Tai Chi Chi Kung, Advanced Breathing Practices and more. Jerry Alan Johnson, Pacific Grove, CA: An extensive Medical Qigong training. I received my Master of Medical Qigong certification from Jerry and the International Institute of Medical Qigong. Bob Lau, Bellingham, WA: Chen Style Taiji, Xin Yi Liu He Quan (Heart Mind Six Harmony Fist), and Qigong. Bob’s key teachers include George Xu of San Francisco, Ma Hong of Beijing, and Qian ZhaoHong of Shanghai. Paul Li, San Francisco, CA: Wild Goose Qigong. Paul was an early student of the famous Yang Mei Jun, the lone holder of this of intricate and playful style of Qigong. Bob Shapiro, Bow, WA: My training partner since 2003. From him I have been learning Yang style Tai chi, Tai chi sword, Tai chi Qigong, and more. I have learned from many other teachers, some for just a two-hour class or weekend workshop. Some for slightly longer periods of weeks or months. Some teachers I have been privileged to learn from via their books or videos. It all helps. I am grateful that I continue to learn from the lessons of all these teachers, including the ones I no longer study with. Over time, and with experience and practice, their teachings take on new meanings for me, with fresh perspectives and greater understanding. Robert offers individual healing sessions, private lessons and classes and workshops. Both healing and the teaching are in the topics of Self-Healing Qigong, Medical Qigong, and Cranial Sacral Therapy. As a teacher he likes to encourage and inspire, give personalized feedback and simplify concepts to get to the essential information. He also likes workshops to be fun: We all learn better when we are relaxed and comfortable with each other. Robert’s healing sessions are based on the belief that deep within everyone is the ability to learn, grow, and heal. Everyone has the ability to heal, and deep within them are the answers to their true healing needs. A healing session is more than a method for pain release and problem solving, it is an opportunity for attaining more self-awareness and personal growth. It is a path to greater wisdom. The healing sessions are generally done on a soft and comfortable massage table, utilizing gentle touch, expanded focus and healing energy to help access their innate deep healing wisdom. 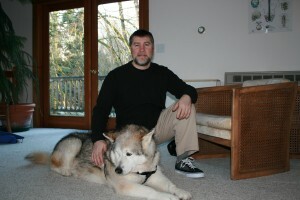 Robert lives with his wife Kathy, their fast-growing puppy Ponderosa (Malamute/Newfoundland cross), and 2 orange cats. They live on 10 usually-quiet acres in Whatcom County, Washington State, just 10 minutes from Bellingham. They are surrounded by trees, meadows, ponds and gorgeous gardens, with trails winding throughout. Robert takes care of the trails, lawn mowing and wood cutting. Kathy is the owner of Tapestry Garden Designs: As a tremendously skilled gardner, the extensive and gorgeous garden beds are her department. The healing and workshop space amidst this setting is an ideal place to heal and learn. Beautiful and spacious, the facility has natural light, a high cathedral ceiling, and a strong healing charge. This blog is based on the belief that practicing the gentle movement art of Qigong is one of the best methods of regaining and maintaining health. It is healthcare that is proven, teachable, easily doable, highly effective, and inexpensive. In these times of rising medical costs, Qigong can be one of the best methods of medicine available. Sign up for the Newsletter below.